See the new MMP Master List for Facebook Groups: CLICK HERE! Kwik Swap Columbia, MO - Yahoo group. St-Louis-Garage-Sellers - MMP Recommended. Yahoo group. KC For Sale * - Yahoo group. Family 2 Family St. Louis - MMP Recommended. Yahoo group. KcAll - MMP Recommended. Yahoo group. KC Trading Post - Yahoo group. Missouri Pet and Livestock Classifieds - Yahoo group. Kwik Swap Jefferson City, MO - Yahoo group. Southwest MO Trade - Yahoo group. SW MO Trading Post - Yahoo group. Mid Missouri Trading Post - MMP Recommended. Yahoo group. St. Joseph, MO Marketplace - Yahoo group. Kwik Swap Moberly, MO - Yahoo group. Lebanon Daily Deals - MMP Recommended. Yahoo group. Kwik Swap - Jefferson County MMP Recommended. Yahoo group. Kansas City Craigs List - Free "for sale" online classifieds. Kansas City Backpage - Another free "for sale" online classifieds. RollaNet Classifieds - MMP Recommended. Central MO. St. Louis Craigs List - Free "for sale" online classifieds. St. Louis Backpage - Another free "for sale" online classifieds. MMP Recommended statements are given to groups that are supportive of Missouri Marketplace and are receptive to want to work together towards the same causes of helping to keep our landfills emptier and wanting to give Missourians options on how to get rid of their unwanted stuff. Group owners and/or mods can contact the MMP admin to find out how they can get their group recommended. Zip Code Map of Missouri - Helps you determine what part of the state a post is from. MapQuest - Your best source for directions to pick up or deliver your item. Ebay's Completed Auctions - Find out what the going price is for the item that you want to sell. Tiny Url - This comes in handy on the Yahoo group when URL's are too long and get cut off. Make them smaller here for FREE! 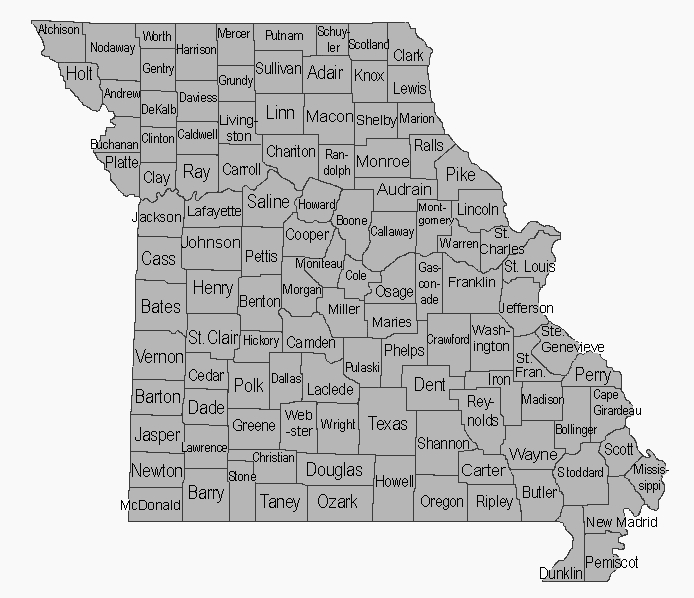 Missouri Counties Map - Helps you determine where a posters county is in Missouri. Make them smaller here for FREE!